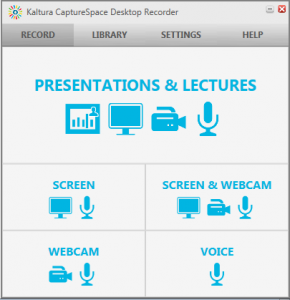 To record a screen and voice recording please click on ‘Screen’ in the CaptureSpace window. 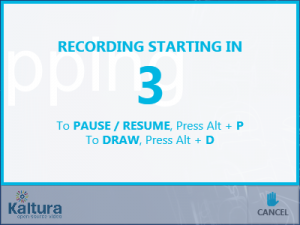 In the following window, choose the screen you want to record. The first screen (which is also highlighted by default) is your main/primary screen, other screens are secondary screens. Click on the display you wish to use and find the name of that screen by clicking on the screens (the screen with the miniature ‘Windows Start Menu’ is your primary screen, not necessarily the screen with the number 1 in the circle, as shown below). A Countdown timer will appear (counts down from 5 seconds). If you decide that you aren’t ready after all, press cancel. The first keybinding of Alt+P lets you pause and resume the recording without exiting the presentation screen. The second keybinding of Alt+D allows you to draw on screen which is useful to outline or point to a certain part of the screen. After the countdown finishes your recording will begin. If for whatever reason you wish to pause or cancel, press the appropriate button. During recording you can press Alt+D to draw on screen, or push the draw button in the capture menu. When you are done drawing, please press the ‘done’ button in the draw menu. When you are finished recording, press done. The video will start to save and open the edit window which will show a progress-bar where the system is busy creating thumbnails for the editor timeline. Afterwards a new window will open with some edit options (a partial screenshot is shared below). The top bar to the right of the play button is the timeline. Below the timeline are the four edit options with to the right a preview window. When you choose to either trim or chop your video two blue ‘dots’ will appear on the screen. You can drag these along the timeline to choose the start and endpoint of your edit. When you trim everything between the start and endpoint will be kept, everything to the left and right of those points will be deleted. When you choose chop everything between the start and endpoint will be ‘chopped’ from the video. When you have selected the proper area to trim or cut from press apply. 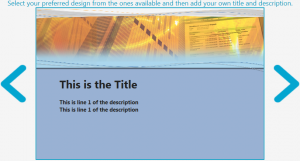 If you wish to add a title or credit screen press the appropriate button. Respectively the title screen will be added to the front of the video and the credits screen will be appended to the end of the video. The titles/credits will be downloaded for use. A new section will appear in the preview window with some options for the title/credits screen. Choose a background by pressing the < or > buttons to the right of this section. Enter a title or end-title. Add a description for the title screen or a list of people who worked on this video in the credits screen. When done with the titles choose apply. Repeat the above steps if you wish to edit more or choose done when you are finished. Pressing cancel will restore the video to original. In the next screen after you choose done or cancel you will get the option to name your video, give a description and add tags. For searchability we recommend giving a proper name, description and as many tags as you can think off to classify your video. Choose upload to upload your video to Kaltura. Choose preview to go back to the editing screen. Press save to save a local copy.